I was minded to say that people would be pleased to see this reissue of two picture books by Edward Gorey dating from 1969 and 1970 and not previously, I think, available in Britain. But after an admittedly small survey I find that Britain is largely ignorant of Edward Gorey and certainly not up to acknowledging him as one of the great masters of book illustration of the twentieth century. 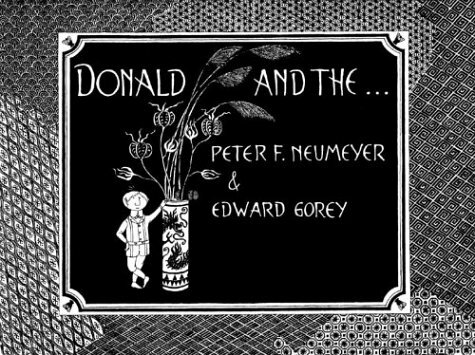 Peter Neumeyer, who (among other avocations) taught children's literature at the University of San Diego, acknowledges in two separate postscripts to these 'Donald' books that they were done in close association with the artist and they do indeed possess one of his hallmark attributes: phenomenal powers of design applied to wilfully fatuous stories, not unlike those that feature shaggy dogs. In the first, Donald (a little old man of a child) finds a white worm in the garbage can - a receptacle of rococo splendour - and after sixteen page-openings we find out what it is. In the second, Donald gets a splinter in his calf 'when he pushed a tree' and the rest of the book is occupied by his stately mother undertaking a painful extraction with 'a tray of instruments'. 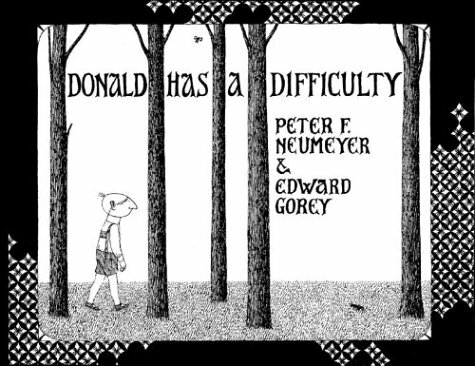 The formal cadences of Neumeyer's brief texts, matched by the wondrous precision of Gorey's designs, set up what is really a satire on the raucous indiscipline of so many of our contemporary picture-book makers. Perhaps that's why recognition is lacking.